Yesterday, WeChat introduced WeChat for Windows desktop (English version), and after playing with the software for almost a day, I can safely say that it’s not only easy to stay connected with all of my mobile WeChat friends, but it’s also a lot more useful. WeChat for Windows includes a powerful file sharing tool that allows you to instantly share your files, images, documents, and more with all of your WeChat friends. They’ll be able to receive what you send whether they’re using the desktop program or WeChat on their mobile devices (iOS, Android, and Windows Phone). To get started, you’ll first be asked to log into your WeChat on the desktop by scanning a QR code through your mobile following a process similar to following official WeChat accounts. Tap on Discover and then tap on Scan QR Code to open the QR code scanner. From there the process is self-explanatory. For those of you who are curious, you can start file sharing by clicking or tapping on the square icon to share a file (shown above) and then pressing the Enter or Return key on your keyboard when you’re ready to send the message. Select the scissor icon from the conversation. Select the desired window on your screen you would like to screenshot. Resize the image by dragging the corners of the screenshot. When selected, press Enter or Return on your keyboard to send the image. 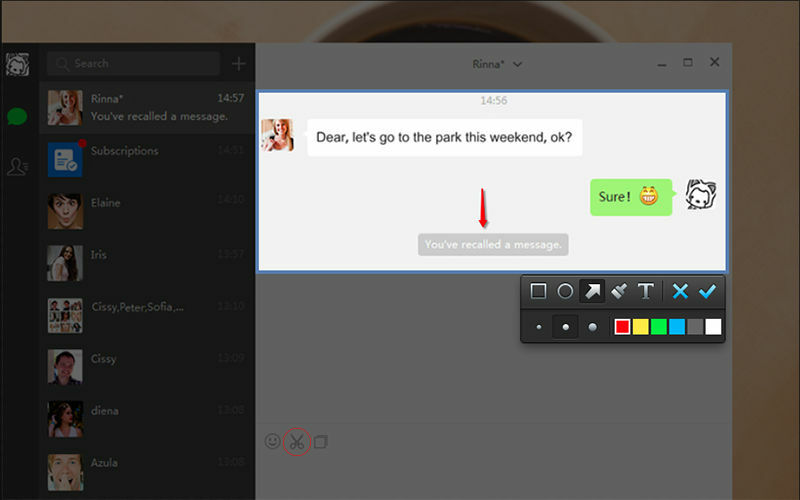 In addition to the above, the new WeChat for Windows also includes popular WeChat features like “mentions” (placing an “@” symbol before the username in a message) and Recall, which lets you recall a message that’s already been sent so you can edit it, perfect if you find a mistake in the message or decide you’d like to say something a different way. You can also you can also forward messages and view Sights sent from your contacts. When you’re ready to go back to your mobile device, your conversations are right there with you so you can pick up right where you left off. All in all, it’s been a massively positive experience, and one I’d recommend for anyone who’s ever wanted to take their WeChat conversations to the next level. The new WeChat for Windows can be downloaded here.